A Shivering Isles loading screen says that the Temple of Kynareth was originally located in Cyrodiil. 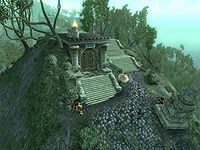 For game-specific information, see the Shivering Isles article. ^ a b Dialogue of Howling Halls residents in the Shivering Isles. ^ Events of the Shivering Isles. This page was last modified on 23 September 2018, at 02:10.